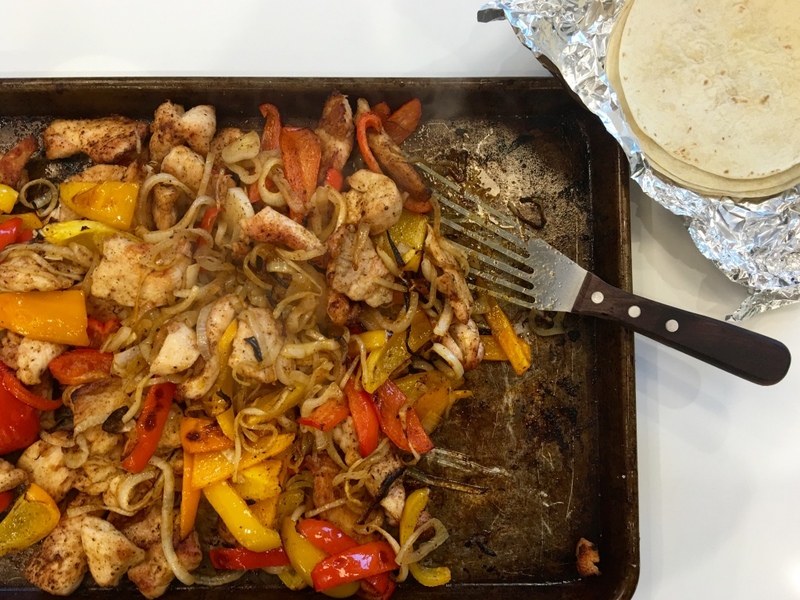 This recipe will change the way you feel about making fajitas at home. It’s so easy! There is a bit of chopping, so if you have a busy evening, chop everything the night before or in the morning. When you’re ready to eat, throw it all in the oven for 20 minutes, wrap the tortillas in foil and toss them in there for 5 minutes, and dinner is served! Spread the bell peppers and onion onto a sheet pan. Drizzle with olive oil and then sprinkle 1 teaspoon each of the chili powder, cumin, paprika, and coriander. Add salt and pepper to taste. Toss to coat the vegetables. Spread the chicken in an even layer on a separate sheet pan. Drizzle with olive oil and add 1 teaspoon each of the chili powder, cumin, paprika, and coriander. Add salt and pepper to taste. Toss to coat the chicken with the spices. Roast both sheet pans for about 20 minutes, tossing once halfway through to ensure even cooking. When everything is cooked, combine chicken and vegetables onto one pan, squeeze on some lime juice, and serve directly from the pan for a casual dinner. Serve with toppings on the side and hot tortillas. Copyright © 2016 Our Everyday Dinners - This is an easy recipe for how to make Sheet Pan Fajitas.